Demand Response providers offer "door-to-door" services. Most require a one-day or two-day advance reservation. In addition to client services, most programs also offer transportation that is available for anyone who needs a ride. Volunteer driver programs allow concerned individuals to help their neighbors by offering rides in their private cars. Drivers are trained and certified by the sponsoring agency, and are reimbursed for costs based on the miles they travel. Rides are arranged in advance. Usually a one- or two-day advance reservation is required. This service is offered to Medicaid patients and social service clients who are unable to use regular public buses, or where other bus and van service is not available. All public transit providers in Maine are accessible and meet ADA guidelines. If you need special accommodations, please call your local provider. A non-profit organization serving all of Aroostook County and parts of Washington and Penobscot counties with scheduled bus routes. A private, non-profit agency that provides demand-response, door-to-door transportation services in Hancock and Washington Counties, including Isle au Haut and, excluding Danforth, for special services for the elderly, MaineCare recipients, social service clients by agency contract and other provider transportation on an individual basis. West's Transportation provides fixed-route and demand response public transportation service to communities within Washington county and eastern portions of Hancock County. Intercity service is provided between Calais and Bangor (named Coastal Connection) with stops in Washington and Hancock Counties along the way. A private, for-profit corporation that provides public transportation services in Cumberland County. Freeport Transit provides door-to-door services utilizing agency vans for MaineCare eligible appointments. Freeport Transit operates Monday through Friday. The Independent Transportation Network (ITN) is a non-profit transportation service for seniors and people with visual impairments. The ITN uses automobiles and both paid and volunteer drivers to provide door-to-door service, 7 days a week, 24 hours a day. 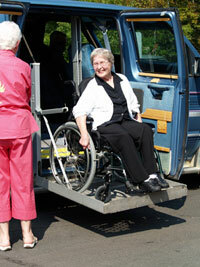 Mermaid can provide specially equipped wheel chair lift vans that can also accommodate ambulatory passengers. These vans can serve locally or out of state. All Mermaid drivers are trained to operate these specially equipped vans. Mermaid also offers airport and train station shuttles and charters. A private, non-profit corporation that provides public transportation services in Cumberland County. RTP provides door-to-door service utilizing agency buses and vans, volunteer drivers, and the family and friends reimbursement program for MaineCare eligible appointments, and also provided commuter service to BIW. A private, non-profit corporation that provides alternative door-to-door specialized transportation on a demand response basis in Androscoggin, Franklin and Oxford Counties. Kennebec Explorer: Provides public flex-route bus service in Augusta, Hallowell, Farmingdale, Gardiner, Waterville and Fairfield. Somerset Explorer: The Somerset Explorer flex-route general public bus service is operating in lower Somerset County. 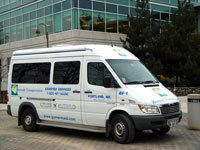 KV Van: Provides demand response, door-to-door paratransit van and volunteer driver transportation program. Eligibility requirements may apply. A volunteer transportation program for seniors and disabled people with services for medical appointments, shopping and life sustaining places and activities. Offering on-demand, free and donation based financing for transportation. 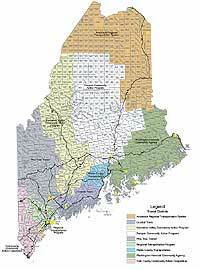 Service Area: Bridgton, Harrison, Lovell, Fryeburg, Denmark, Sebago, Raymond, Casco and Naples. A private, non-profit corporation that provides public transportation in Androscoggin, Franklin and Oxford Counties. Fixed route bus service in Lewiston-Auburn. Seasonal fixed route bus in the Bethel-Newry area – Mountain Explorer. Commuter service from Lisbon to Lewiston – Lisbon Connection. A private, non-profit corporation that provides public transportation on a demand-response basis in Waldo County. The majority of services are oriented to Belfast; however, regularly scheduled trips are made to Bangor, Rockland, Augusta, and Waterville. 207-546-7607 TTY. A non-profit corporation providing public transportation service in York County. YCCAC operates Sanford Transit weekday bus service between Springvale and Sanford, and the WAVE daily van service. YCCAC also provides seasonal service along the coast with the Shoreline Explorer trolley and bus routes(www.shorelineexplorer.com)and year-round service with the Orange Line between Sanford and Wells. Operated by Penquis CAP, a non-profit corporation that provides demand response transportation services in Penobscot and Piscataquis Counties. The LYNX provides transportation for the general public, special services for the elderly, MaineCare recipients, social service clients by agency contract, and ADA complementary paratransit for Bangor’s BAT Community Connector.